In a move to stop advertisers being able to track your every move and publish personalised adverts as you browse the Internet. Google and Mozilla will be adding a new set of tools/extensions to their Chrome and Firefox browsers. Following the advice from the FTC to add a Do Not Track options. Microsoft has also said its plans to add a Do Not Track feature to its browser but hasn’t released any details as yet. The new features being add to the Chrome and Firefox browsers will allow users to tick a box to disable the automatic browsing history that is then used to send out targeted ads. With Google and Mozilla taking slightly different approaches to its implementation. 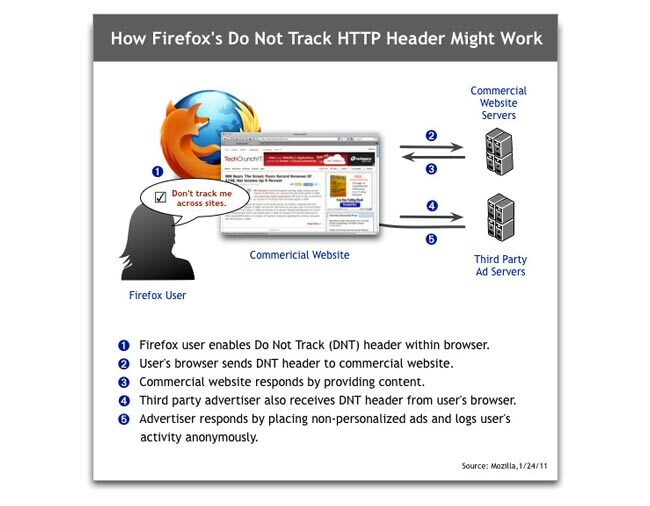 Firefox’s new feature explained by Global Privacy and Public Policy Leader at Mozilla, Alex Fowler, will allow users to set a preference that will broadcast their desire to opt out of ad-based tracking. This will be signalled via a Do Not Track HTTP header with every page view or click they make. Firefox believe that the header-based approach has the potential to be better for the web in the long run because it is a clearer and more universal than the use if cookies or blacklists. Microsoft has also said its plans to add a Do Not Track feature to its browser but hasn’t released any details as yet.